I made a fascinator, since I'm going to the races tomorrow! 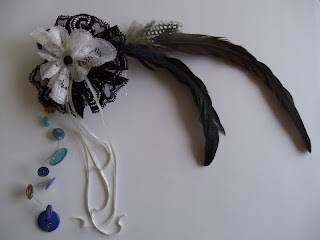 It's a hair comb, onto which I glued feathers, two lace ruffles, a googly eye, curly ribbons, and a weird button dingle-dangle. "And Quick Lightning is in the lead, he is only a few meters away from the finishing line...and look, there is Chrissy with her brilliant fascinator on. Oh dear, it looks like Quick Lightning crashed when the jockie looked at Chrissy's fascinator and Blue Mountain has won the race." I like the buttons and feathers!